Wood Base Word Etching Desired? Wood Base Word Etching Desired? No words. Yes. Spell out words. Now you can have a great etching inside your home, office or vacation home as well as on your car's windscreen! 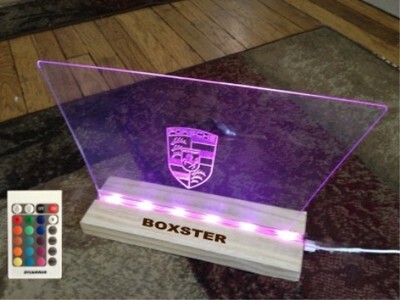 Our desktop etching kit comes with your choice of etching, a wooden base in either pine or oak and a multi-color led light and controller. Just plug in your led in a standard outlet and pick a color from the digital controller and your set. Colors can also be dimmed or set to change with the controller. It's a great conversation piece, nightlight and display. You can put it on any flat surface like a desk, table, or shelf. Approximate size is 12" tall and 12-15" long. Screen is tilted at approximately 30 degrees for optimum viewing.